Celebrate the season with a fresh take on a holiday classic. Isis Restaurant and Music Hall hosts It’s a Wonderful Life: Live From WVL Radio Thursday, Dec. 1 at 8 p.m.
“This is truly an amazing event and a great way to kick off the holiday season with the entire family,” said Lillianna Woody, who co-owns Isis Music Hall with her husband Scott, sons Harris and Martin, and daughter Josephine. This original adaptation, created by the Immediate Theatre Project (ITP), brings a unique twist on the Frank Capra holiday classic It’s a Wonderful Life. 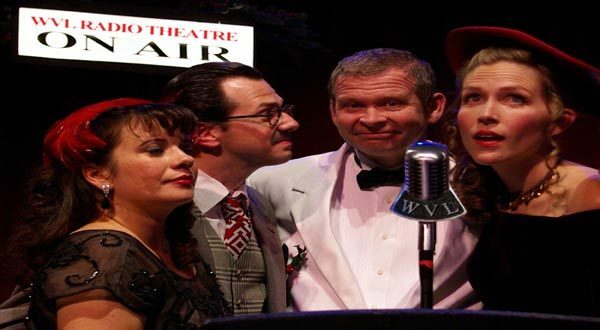 Set in the failing fictional studio of WVL Radio Theatre, the audience is cast as a live studio audience attending the broadcast of “It’s a Wonderful Life,” circa 1946. “I love the Wonderful Life story, but when creating this adaptation, I also really wanted to engage the audience in a different way,” said Willie Repoley, ITP producing artistic director. As the story unfolds, WVL Radio actors are stuck in a snowstorm, leaving only a skeleton crew to try to perform the show and to save the station before it goes under. The 2016 tour hits 14 cities nationwide, but the Asheville show just happens to be near and dear to their hearts. ITP originated as part the NC Stage Catalyst Series in 2004, and now produces plays both independently and as the Partner Company in Residence at NC Stage in downtown Asheville.